Australia exports lots of things - coal, natural gas, manufactured goods, minerals, agricultural produce, meat, live sheep, wine, ... . One export of which we cannot be proud is Dr [Trademark], author of a string of execrable books devoted to exploiting people's fears about their health and moving their money into her bank account. An indication of Dr [Trademark]'s contempt for both the truth and her readers is the fact that she can't tell a consistent story about her university qualifications. Also, on the covers of many of her books and on her web site she is referred to as "[Trademark] MD". Dr [Trademark] is indeed a medical doctor, but that alone does not entitle her to put "MD" after her name. You will notice that the university has changed. The University of South Australia has no medical school and therefore cannot graduate anyone with qualifications to become a medical practitioner. (The University of Adelaide does have a medical school, but it is not the University of South Australia.) You will also notice that she does not refer to her real, earned degrees of MB,BS, but instead now holds herself out to have a degree awarded by some unnamed American university. The letters "MD" after her name suggest that she holds a "Doctor of Medicine" degree, but nowhere does she say where she got such a qualification. Also, on the covers of many of her books and on her web site she is referred to as "[Trademark] MD". Convention also is that doctors do not claim to be specialists, in this case a "liver doctor", without proper postgraduate training. When Dr [Trademark] mentions her qualifications explicitly she says that she is a diplomate of the Royal College of Obstetricians & Gynaecologists (although she does not claim to be either a Member or Fellow of the College). This does not qualify her to be a liver specialist. Perhaps there are two people called [Trademark] who just happened to be at university in Adelaide at the same time. Comparing the pictures on the two web sites might help to clear up the confusion. 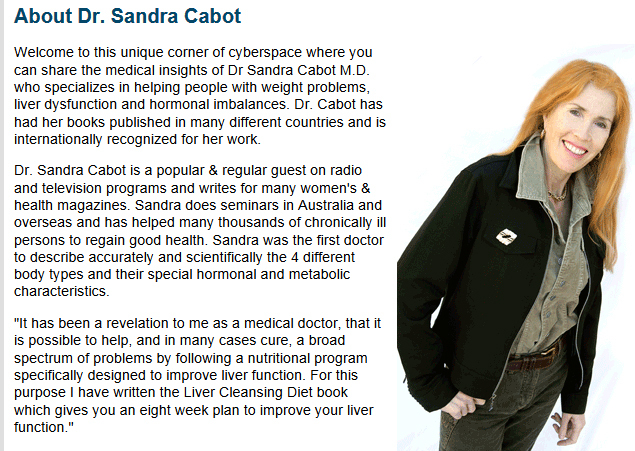 The Dr [Trademark] who is a liver doctor and went to the University of South Australia. The Dr [Trademark] who works in Australia and went to the University of Adelaide. Dr [Trademark] is indeed a medical doctor. My complaint is not that she is not qualified as a doctor, it is that she does not hold a degree abbreviated to "MD". I have been told by an apologist for Dr [Trademark] that she uses the form of qualification issued by American universities as some sort of marketing label so as not to confuse residents of that country. I can only assume that she claims qualifications from a different university (which does not even have a medical school) for the same reason - that she thinks that people outside Australia are so stupid that they will be confused by the word "Adelaide". So what? The facts are that she does not hold the degree of MD and is not entitled to put the initials after her name. I realise that this is only a small thing, but deceit on the cover of a book is a fair indication of the author's attitude to the presentation of facts between the covers. Telling different stories on different web sites just reinforces the impression of dishonesty and duplicity. Some material on this site has been removed or changed because someone selling books promoting quackery who used to advertise her possession of a medical degree she didn't have (from a university she didn't attend and which does not have a medical school) didn't like what was said about the situation. To get the material removed she claimed that her name was trademarked. She had been informed of the contents of this page several years ago but took a long time to decide that even a tiny bit of criticism could put her house of cards at risk. It must be a very shaky house of cards. As she no longer uses the fake degree and has changed her web site to tell the truth about where she obtained her qualifications and what those qualifications are I consider that a victory for me and I am not going to waste any time or money arguing with her in court. And by the way, her name is actually trademarked but there is no Australian trademark registration for "Dr xxxxx", so I guess that she still thinks that she can say things which are not strictly true and nobody will bother to check. You might note that she signs her name using what is supposed to be a trademark, not a legal name, and uses something which is not trademarked when pretending to write out her name in full. 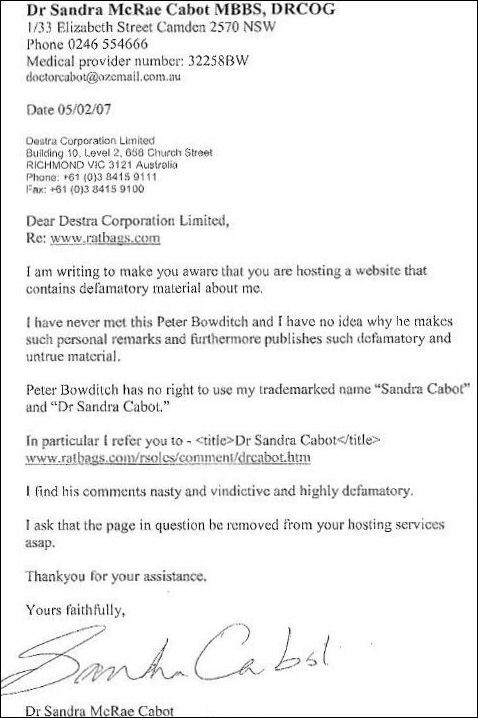 Perhaps I should register my name as a trademark, and then I could threaten people who threaten me. 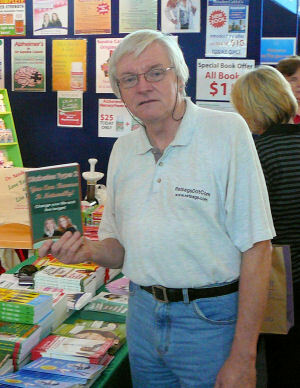 This is a photograph taken at the recent Sydney MindBodySpirit Festival of a person with type 2 diabetes holding a book with the title Diabetes Type 2 You Can Reverse It Naturally!, subtitled "A book to change your life!". You might notice that the book appears out of focus even though other things at the same distance from the camera (eg, the writing on the man's shirt) are much clearer. The only assumption I can make is that the camera has, in addition to such modern magics as face and smile recognition, the ability to detect books which are being held by people who have been threatened by the author. Yes, that's right, folks, this book is the work of the famous Dr Trademark, a person so assured of the correctness of her medical claims that she uses trademark law to prevent people talking about her. At least she doesn't claim a medical degree that she doesn't have on the cover of the books any more. And does she have a method to "reverse" type 2 diabetes? Of course not, but if I tried to analyse her claims she would be forced to respond with lawyers, not with facts. I was thinking about diets this week and that reminded me about about an excellent article written a few years ago about one particular diet. I dug the article out of my comprehensive filing system and you can read it here. One thing that has changed since that time is that the author of the diet book no longer uses the "MD" after her name. Getting her to remove the degree she doesn't have from the covers of her books was one of my little victories over the years.